African-American ceramicists are showcased in Black Clay. Going beyond traditional vessels and pots, Black Clay is a smartly organized show of contemporary sculpture, with diverse subject matter and work that is figurative, abstract and conceptual. Moreso than many exhibitions of contemporary artists, it ranges widely in its representation of themes, references and ideas. The exhibition at Gallery 209/9, curated by artist Sharif Bey, showcases eight African-American artists either from Pittsburgh or from Philadelphia, with ties to Pittsburgh. 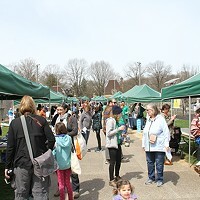 The artists share teaching and learning experiences at venues including The Clay Studio, Manchester Craftmen's Guild, Pittsburgh Center for the Arts and Women of Visions. Mary Martin's "Soul Claps" is a series of hands in varied poses and adorned with Adinkra symbols, patterns and colors. Adinkra is a collection of symbols of Ghanaian origin, now popular iconography and widely recognized as "African." Martin delicately balances the symbols with her own sense of pattern and narrative that insinuate rather than overstate. The body, and ideas of the "black body," are strongly represented in the work of Philadelphia artist Michael Clemmons. At Temple University, Clemmons studied art and African-American history, and his mixed-media sculptures explore ideas and themes related to black life. His sculpture "Ebo Landing: Requiem for Katrina" depicts maimed bodies (missing arms, legs or torsos) staged on a backdrop of clouds and chaos. Clemmons continues a tradition of African-American artists responding to contemporary issues and concerns. Vanessa German, too, addresses violence, womanhood, community and race. German's pieces include mixed-media sculpture and installations. Her "Jena 6, Homewood 6, Etc." is a powerful piece. "Jena Six" is the name given to a group of six black teen-agers, charged with attempted murder for the beating of a white schoolmate, in Jena, La., in 2006. The controversial case drew protests nationally. Syd Carpenter, who chairs the studio-arts department at Swarthmore College, makes conceptual work that stretches the imagination. Rich ceramic surfaces and beautiful, irregular color and texture references nature: plant, animal and human forms. 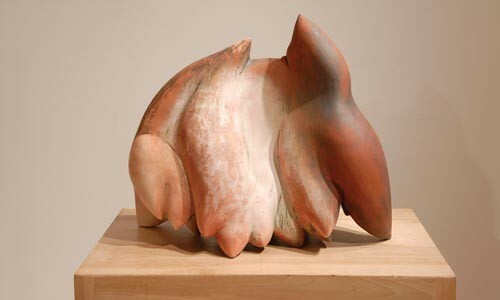 Carpenter's "Old Soul" is a beautifully colored reddish-brown clay piece that resembles an animal figure or the slope of person's back, depending on the angle. Black Clay also includes equally interesting work by Malcolm Mobutu Smith, Justin Coleman (of Providence, R.I), Paul Andrew Wandless (Philadelphia) and Pittsburgh-born curator Sharif Bey himself. It's worth noting that Pittsburgh's Manchester Craftmen's Guild played a key role in the lives of these artists. For some, it was the place where they were exposed to ceramic work as teen-agers; for others, like Martin, it was the first place they had the opportunity to teach, exhibit or serve a residency. Providing a place for artists to present new ideas that can be appreciated by audiences -- that's the role of a cultural center. Well done. Good form: Syd Carpenter's "Sebi"